I haven’t done a garden update in a while, but for the most part, my summer plants have stopped producing and have been pulled up. In their place, I’ve planted a new crop of winter veggies! Turnips, carrots, beets, radishes and broccoli. I’ve never lived anywhere with weather conducive to winter gardening, so I’m pretty excited to see how things grow. Though most of my summer plants are done, there are two exceptions (three if you count the rosemary that has morphed into a giant bush); my watermelons are still going strong (and now that it’s not super hot out, they aren’t all bursting) and my eggplants are going crazy! I’ve made 4 huge batches of Cheesy Eggplant Parmesan. The eggplant parm is delicious but, needless to say, I’m pretty sick of it! So I was on a mission to figure out what the heck else I could do with a million and one eggplants. 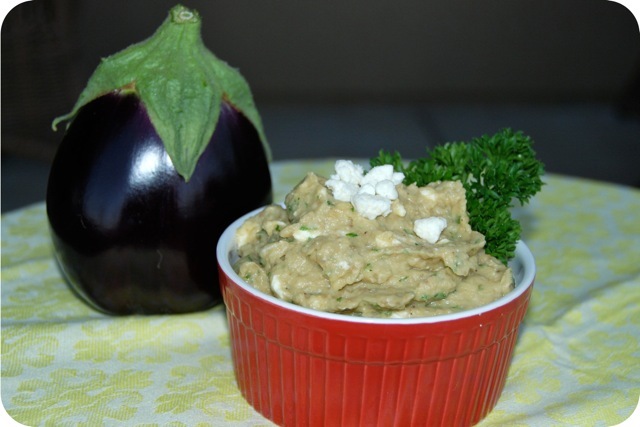 The answer came in the form of a creamy dip, reminiscent of hummus but made with eggplant instead of beans, studded with fresh parsley and tangy feta cheese. 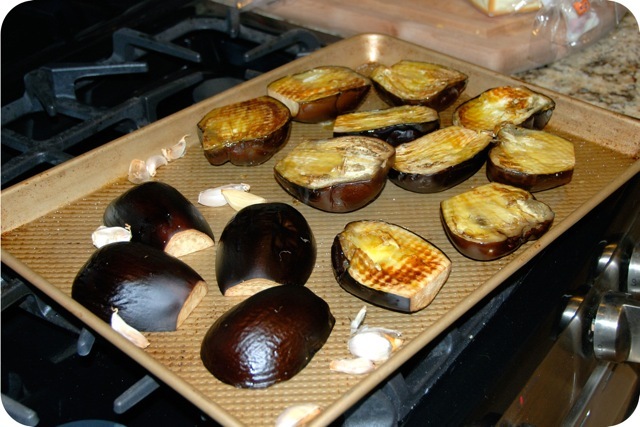 Halve eggplants and brush with olive oil. Roast on a baking sheet at 400 degrees until soft, about 25-30 minutes, turning once. Add the garlic cloves (still in skins) to the baking sheet halfway through cooking time. 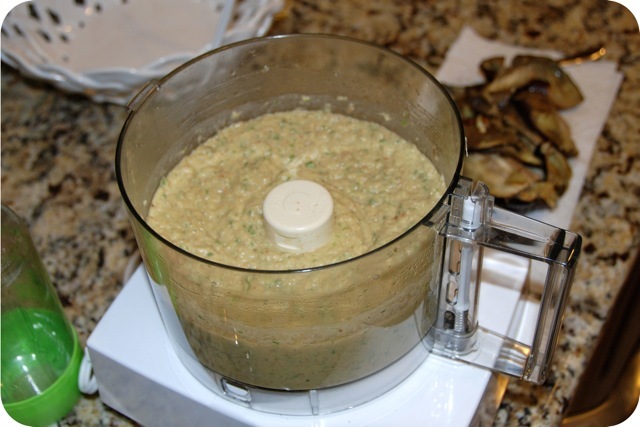 Let the eggplants cool, then scoop the flesh out of the skins into a food processor. Peel the garlic and add to the eggplant. Add the olive oil and lemon juice and puree until smooth. Season with salt & pepper. Add the parsley and pulse a few times to incorporate. Transfer the dip to a bowl and stir in feta. Serve with crackers or chips! 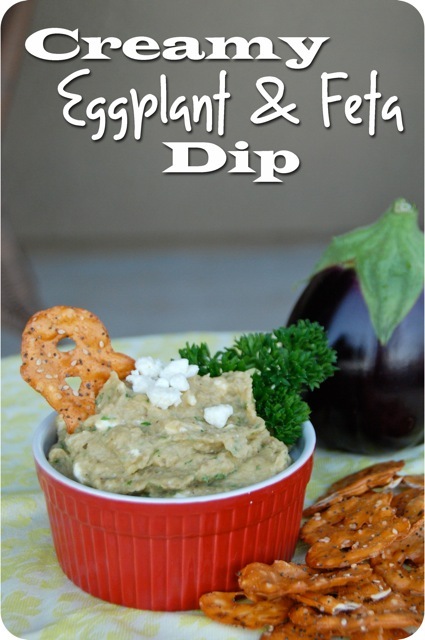 We loved this dip and it would be great for your next football get together! 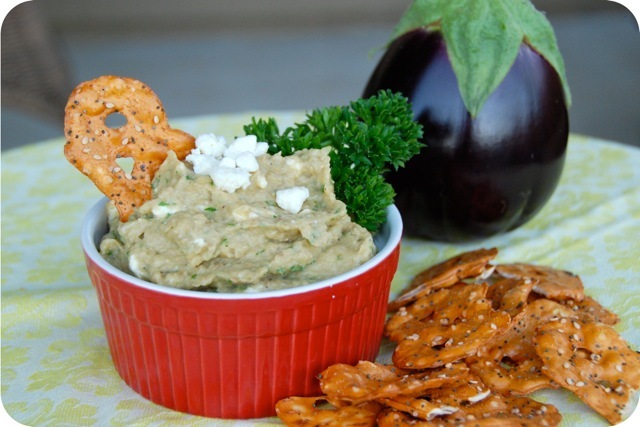 Here are a couple other dips you might want to check out!